There are lots of different types of crime and most people will experience a crime at some point in their lives. Crime rarely affects just one person, it has a ripple effect and can impact on whole families, friends and colleagues. Experiencing a crime can have a significant impact on mental and emotional well-being. Everyone reacts differently and it’s normal to feel confused about the Criminal Justice System and the options which are available to victims, witnesses and others who may be affected. How individuals react to crime depends on lots of different things — such as the crime itself, the sort of person they are, and the support they have around them. From October 2014 grant funding for the commissioning of local services to support victims of crime and deliver restorative justice moved from the Ministry of Justice to Police and Crime Commissioners. The legislation aimed to provide Commissioner’s with clear powers to provide or commission a wide range of services for victims, witnesses and others affected by offences and anti-social behaviour. The renewed focus on meeting victims’ needs also led to the Victims’ Code being reviewed and revised, with the new Code coming into effect in October 2015. This has all created a greater focus on understanding and catering for the needs of victims of crime and provided an opportunity for change. One of the key priorities for Cumbria’s Police and Crime Commissioner is “Putting Victims First”. Everyone has the right to feel safe in their home and community and get the support that they need to cope with the immediate impact of crime and as far as possible recover from its effects. If affected by crime, there are a number of ways to get support or information. It doesn’t matter when the crime took place or whether it has been reported to the police, free and confidential support services are available, for further details of services available in Cumbria visit www.cumbriatogether.com. Your rights are explained in the Victims’ Code www.gov.uk/…/the-code-of-practice-for-victims-of-crime The Code tells you what you can expect from criminal justice agencies, including the Police, the Crown Prosecution Service and the Courts. To view the Victim’s Needs Assessment please click here. To view the role for the Victim’s Advocate please click here. The Victim’s Advocate can be contacted at the Office of the Police & Crime Commissioner. Details can be found on our Contact page. To view the ‘Turning the Spotlight Perpetrator Programme’– Independent Evaluation Report by the Brathay Trust’ please click here. 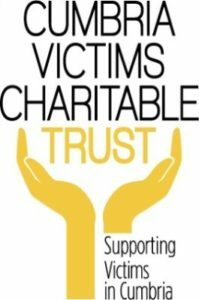 Did you know that Cumbria Victims Charitable Trust provides support to victims of crime who reside in Cumbria? Find out more here.